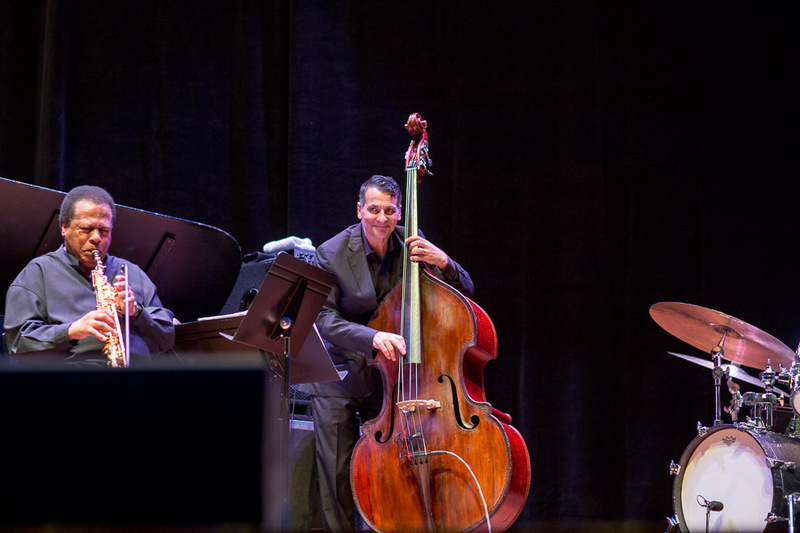 Last night a Cornish College, Earshot Jazz presented Kris Davis and her trio. 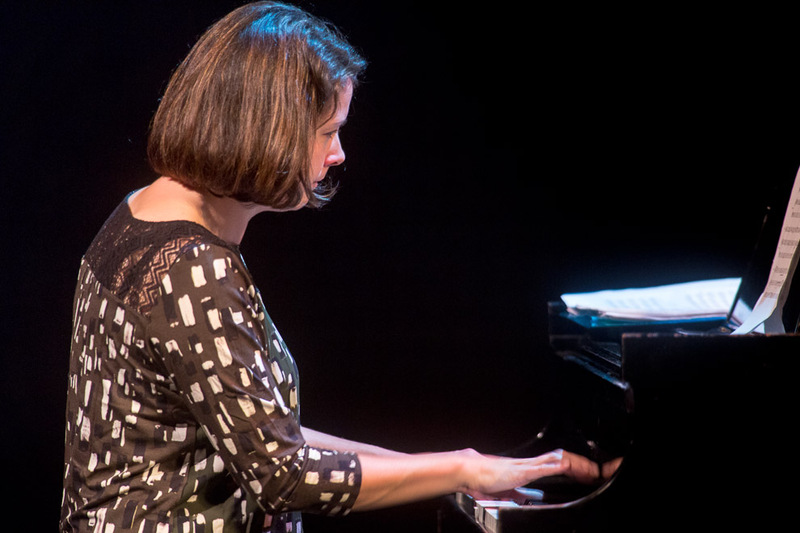 The Vancouver-raised pianist, who has just won a prestigious Doris Duke Impact Award, appeared with drummer Tom Rainey and bassist John Hébert, and performied her darkly energetic, nuanced compositions which were mesmerizing. 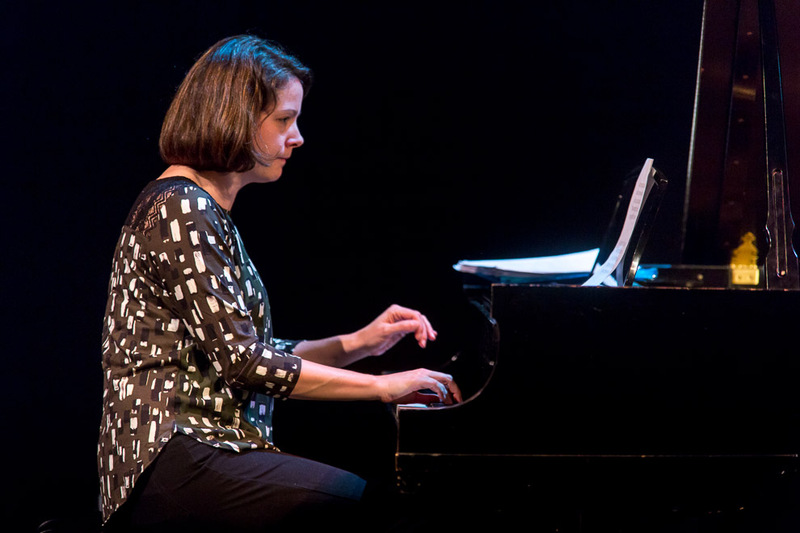 Pianist and composer Kris Davis has developed a reputation as one of the most buzzed-about jazz artists in recent years, noted for her hard-to-pin-down stylistic profile, which encompasses jazz standards, rock rhythms, Cecil Taylor-esque free explorations, contemporary avant-chamber music, and bracing minimalism. Davis has built up a sizable coterie of fans and boosters among the public and peers alike, including piano maverick Jason Moran, who called her “a freethinking, gifted pianist on the scene.” With her depth of skill and considerable experience in multiple musical worlds, Davis has been in high demand, and has performed with a “who’s who” of multiple creative music circles, including Paul Motian, Andrew Cyrille, Tim Berne, Bill Frisell, John Hollenbeck, Michael Formanek, Ralph Alessi, and Mary Halvorson. 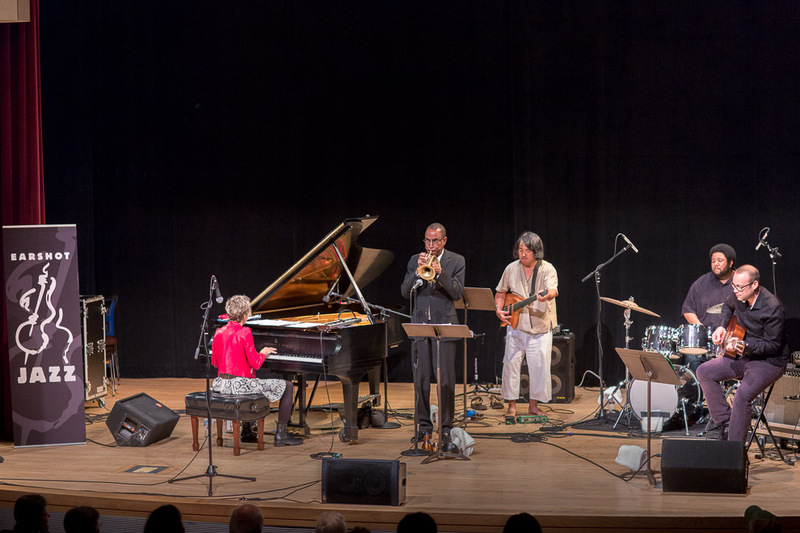 Last night at the Seattle Art Museum Myra Melford played a wonderful set of her hard to describe compositions. 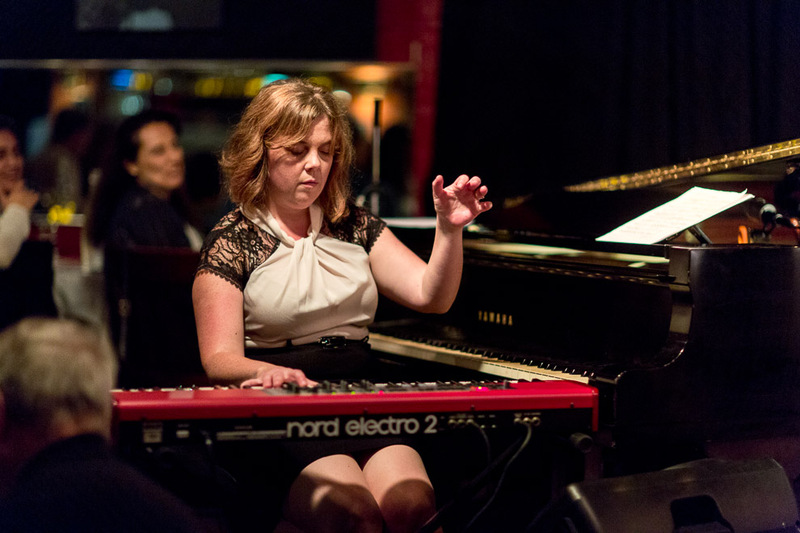 The singular pianist formed this group in 2012 to perform pieces she wrote for its towering talents: Ron Miles (trumpet), Liberty Ellman (guitar), Stomu Takeishi (bass), and Tyshawn Sorey (drums). 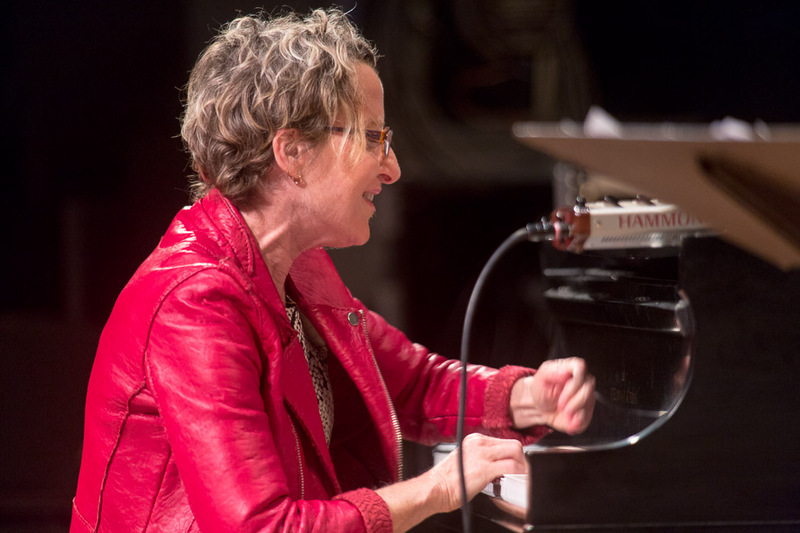 The term “restless” is used with some frequency to describe modern creative musicians with varied sets of proclivities, collaborators, and outlets, and that description may be an apt one for the iconoclastic pianist and composer Myra Melford. But what’s impressive about Melford is how centered and at home she sounds in all of the myriad projects she has been involved with since her emergence in the early ‘90s. 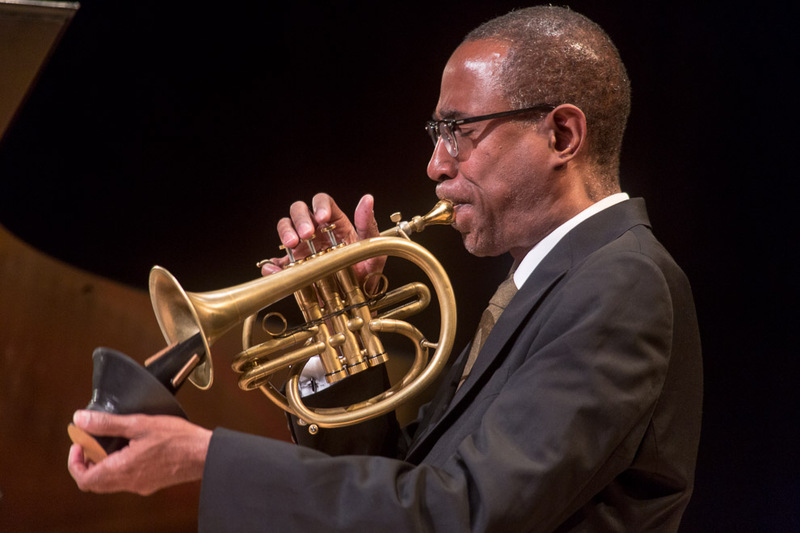 Shaped and emboldened by formative periods of study with Don Pullen and Henry Threadgill, Melford is a composer and musician of seamless range and variety. 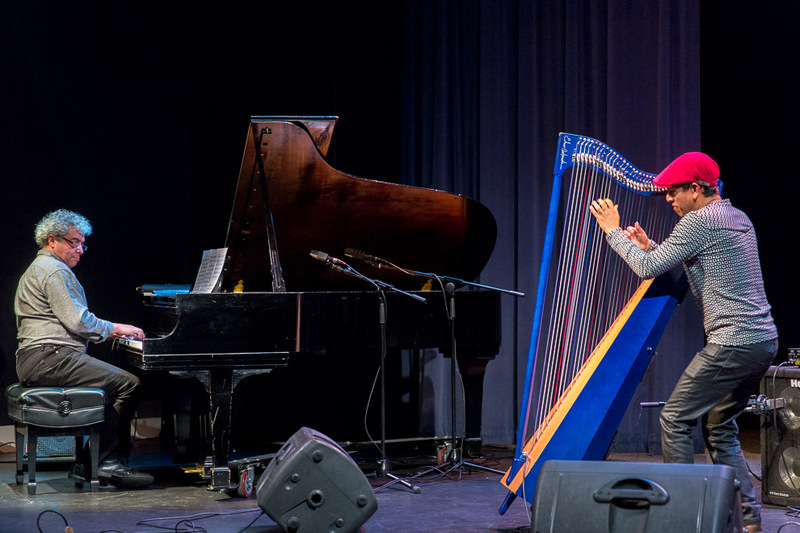 There is a spiritual tinge and particular geographic orientation to much of her music – experiences such as a trip to India on a Fulbright scholarship and an immersion in the writings of Sufi mystic poet Rumi have had a tangible effect on her aesthetic. 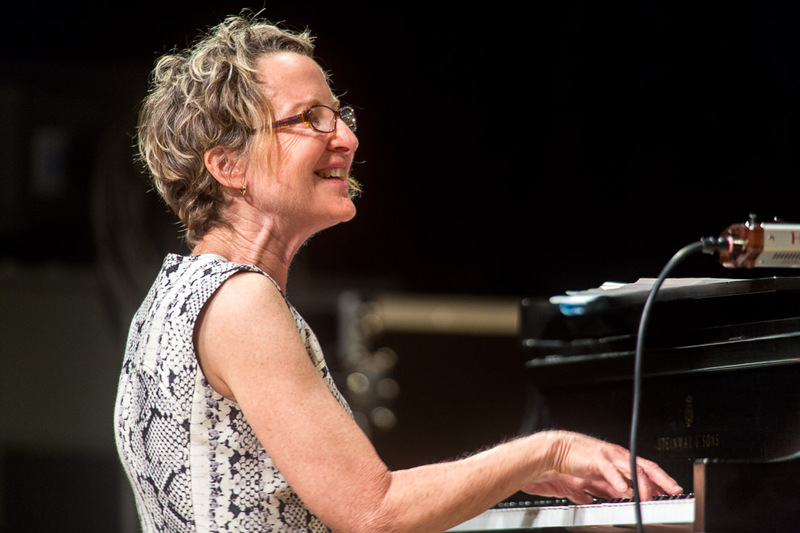 From solo piano music to large-scale ensemble creations, her wide-ranging output has brought her into collaboration with a staggering array of the most creative musicians of recent times, including Cuong Vu, Dave Douglas, Han Bennink, and Leroy Jenkins. 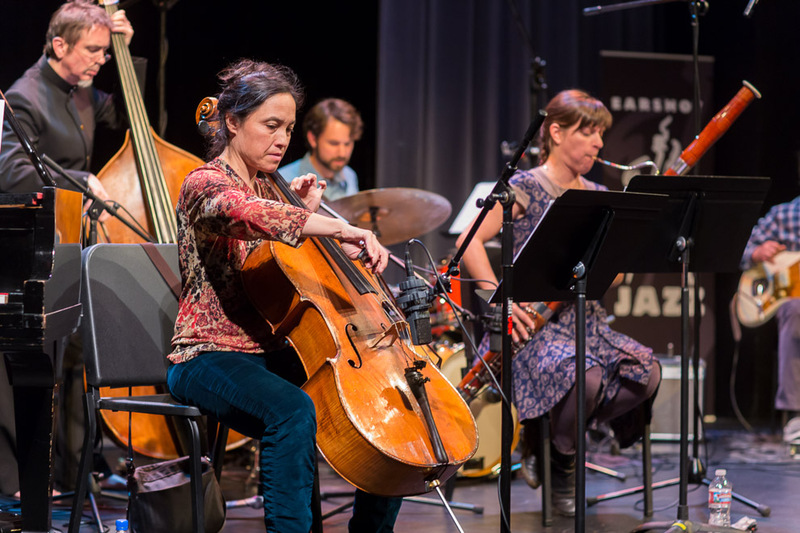 Snowy Egret is Melford’s latest group, and one of her finest to date. 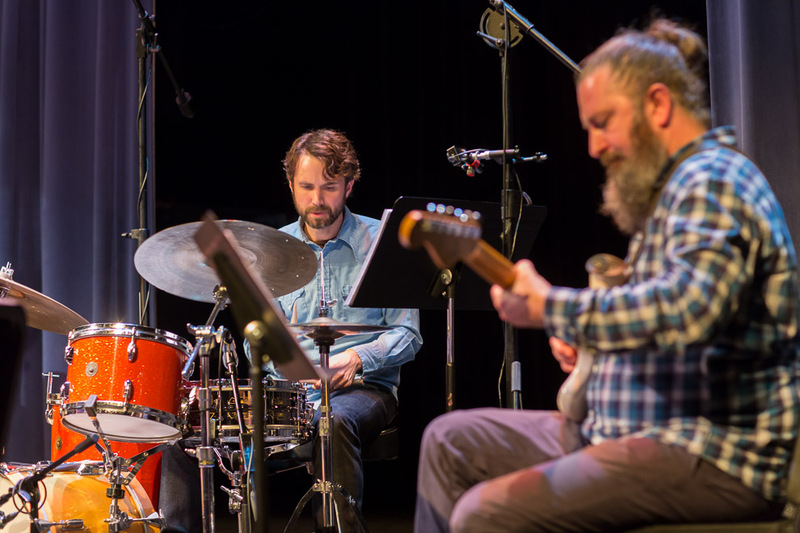 Featuring Ron Miles on cornet, Liberty Ellman on guitar, Stomu Takeishi on electric bass, and Tyshawn Sorey on drums, Snowy Egret is a band full of imposing improvisers, capable of exacting focus but with a flexible, elastic sense of rhythm and interplay. Inspired by the writings of Uruguayan author Eduardo Galeano, the band’s recent self-titled album is a feat of balance and nuance. There is a notable Latin American influence in some of the writing, but the music is of its own world, simultaneously earthy and cerebral. 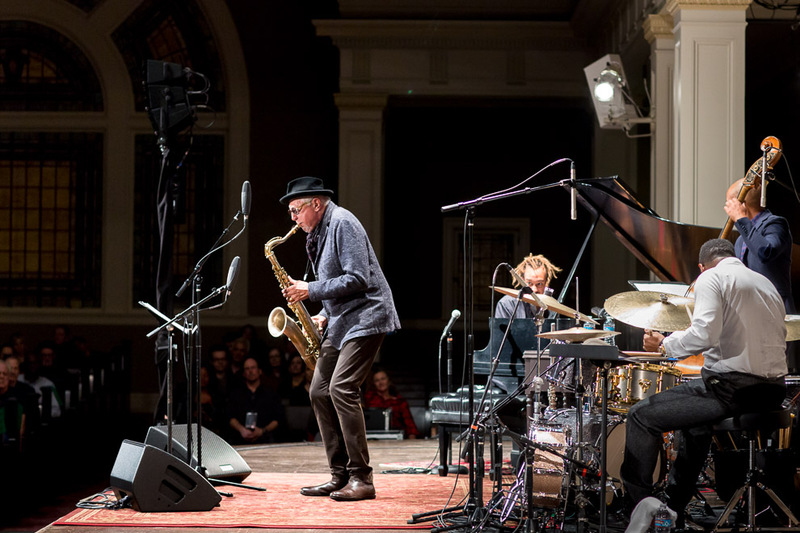 Henry Threadgill remains one of Melford’s key mentors, and his influence is present both musically and in shared personnel (Ellman and Takeishi are both long-time members of Threadgill ensembles), but the vision is uniquely Melford’s own. Gospel grooves, pointillistic free passages, and knotty ensemble writing all share space, and blend into a dreamy whole, both familiar and comfortable yet bracingly new. 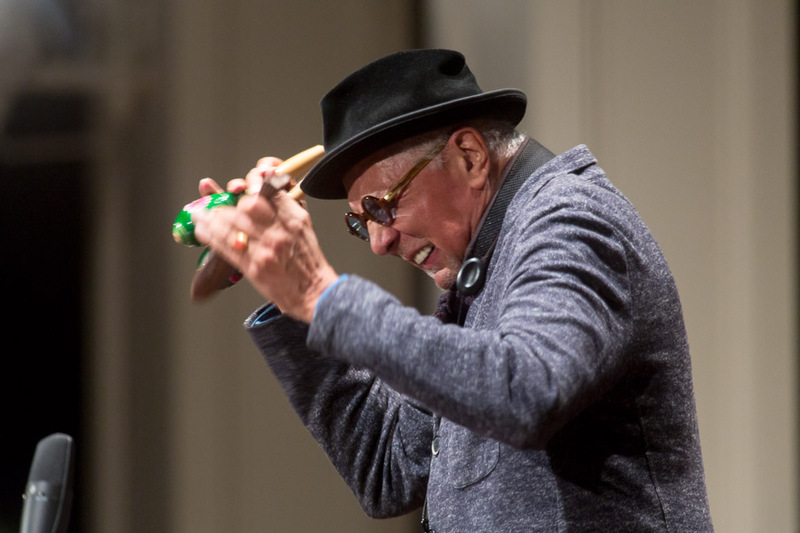 Charles Lloyd, the multi-horn mystic returned to Seattle last night, with another another riveting séance. 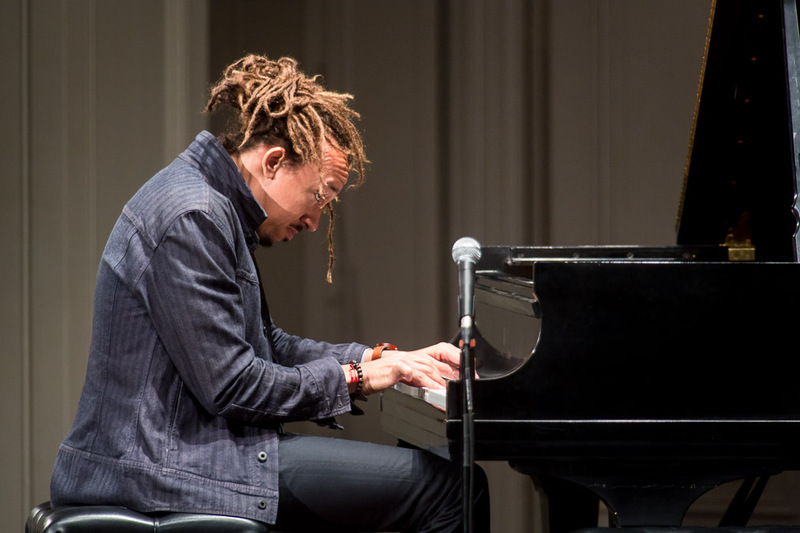 His newest quartet called on brilliant contemporaries Gerald Clayton (piano) and Kendrick Scott (drums) along with veteran bassist Reuben Rogers. 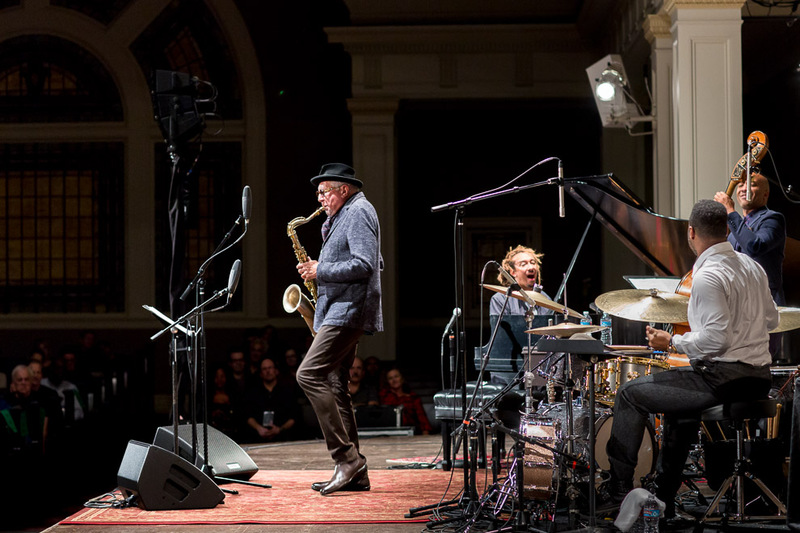 After nearly five decades of utterly uncompromising music-making, saxophonist Charles Lloyd has achieved the status of a living legend. 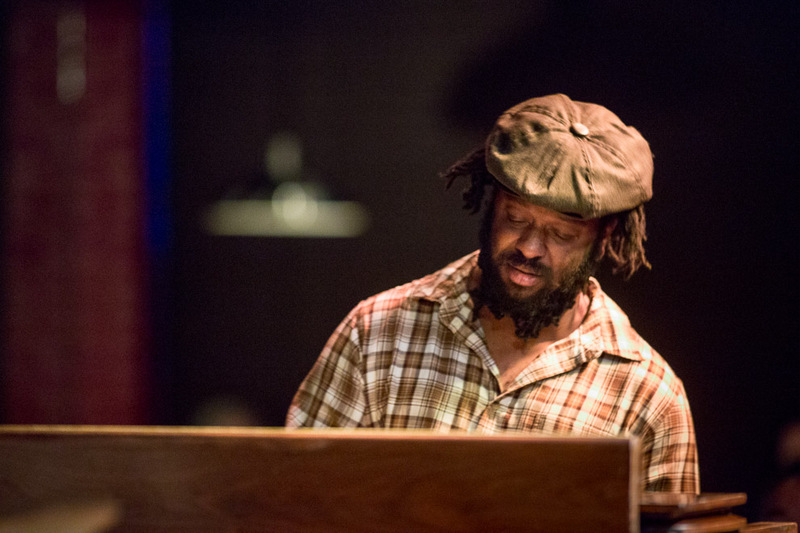 A singular musician who has no stake in nor need for the genre divisions that frequently occupy so much energy in the jazz world, Lloyd is one of the original cross-pollinators, whose explorations are rooted and steeped in the rich jazz and blues scenes of his native Memphis, Tennessee, but whose musical interests have taken him around the world, literally and figuratively. 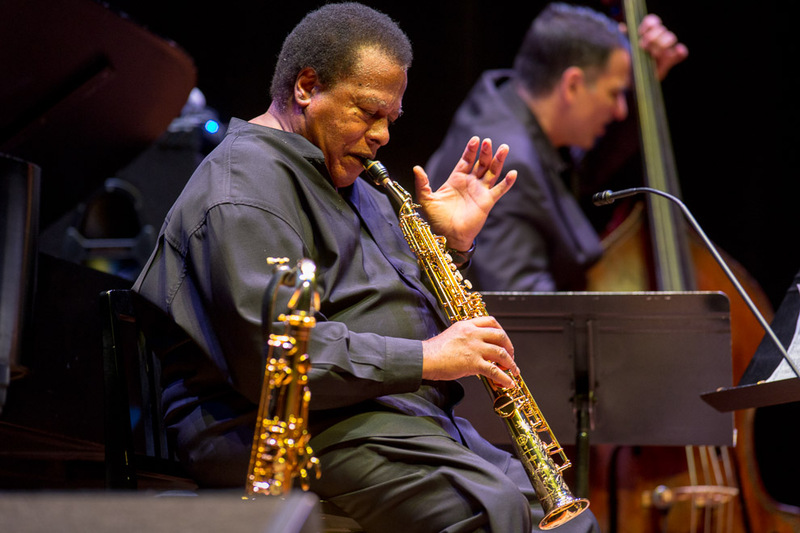 Born in 1938, Lloyd picked up the sax at age nine, and by the mid-‘60s, had developed into not only a masterful improviser but also a superb composer and arranger. 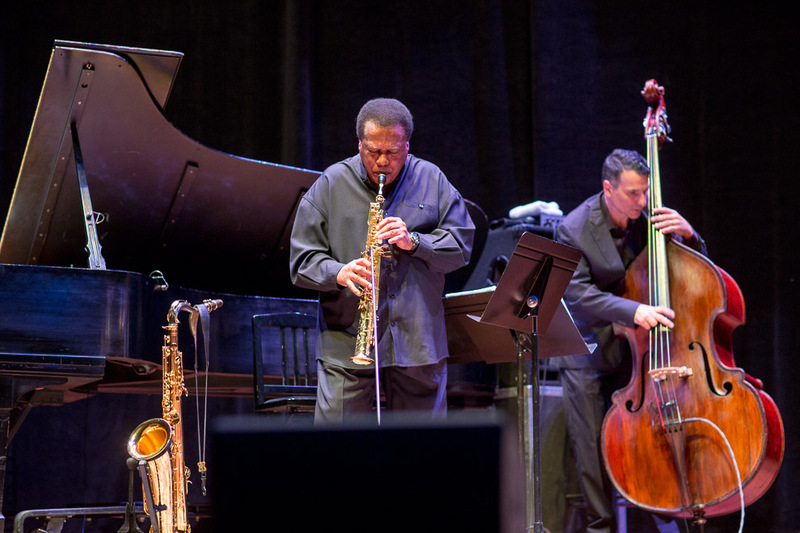 After a stint with Cannonball Adderly’s band, Lloyd formed the first of his many great quartets, with future Miles Davis alums pianist Keith Jarrett and drummer Jack DeJohnette, along with bassist Cecil McBee. 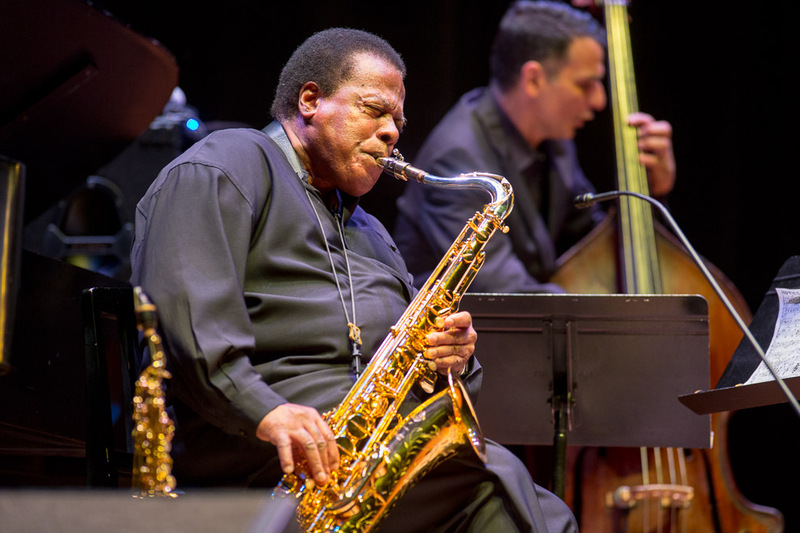 Lloyd’s Quartet appeared at the 1966 Monterey Pop Festival, in a legendary performance that resulted in the album Forest Flower, one of the first jazz albums to sell over a million copies. 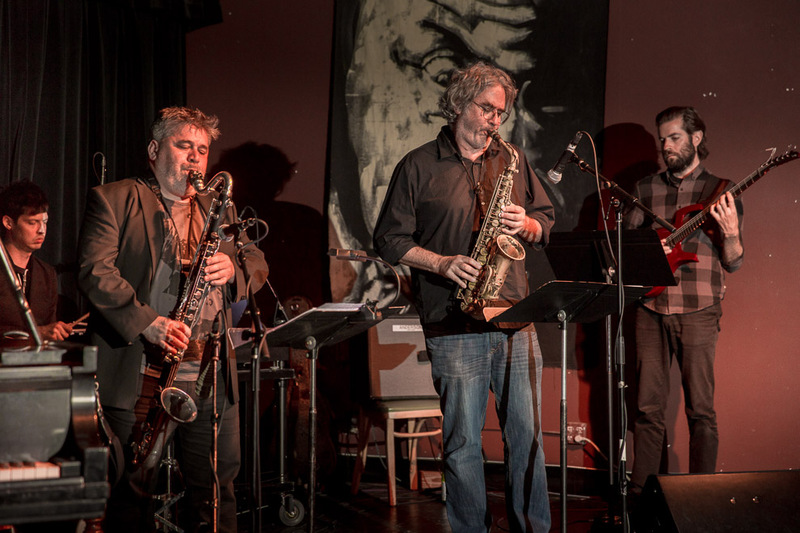 Lloyd’s expansive modal grooves and avant-garde sounds became an integral part of the quickly evolving stylistic integrations of jazz with rock, psychedelic, and non-Western music. 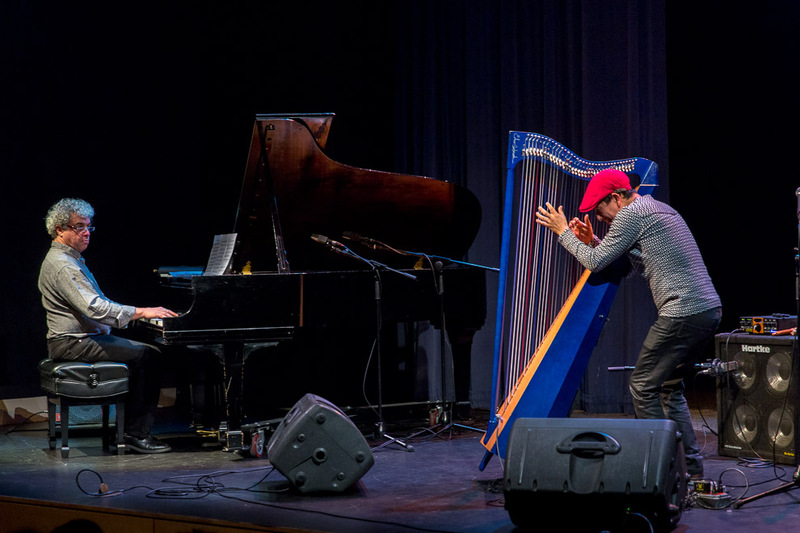 Notably, Lloyd did it with an acoustic quartet – he didn’t have to plug in to cross over. 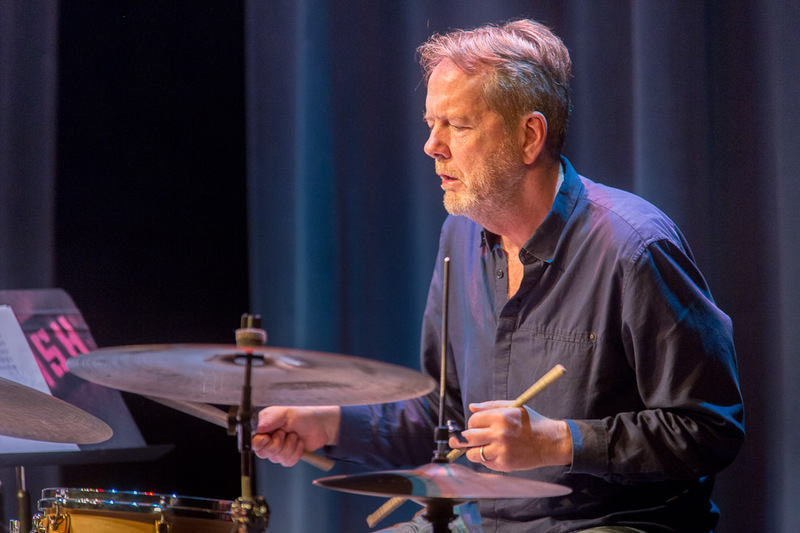 Since 1989 Lloyd has recorded regularly for ECM, which has released an impressive string of superb albums from the busy master. 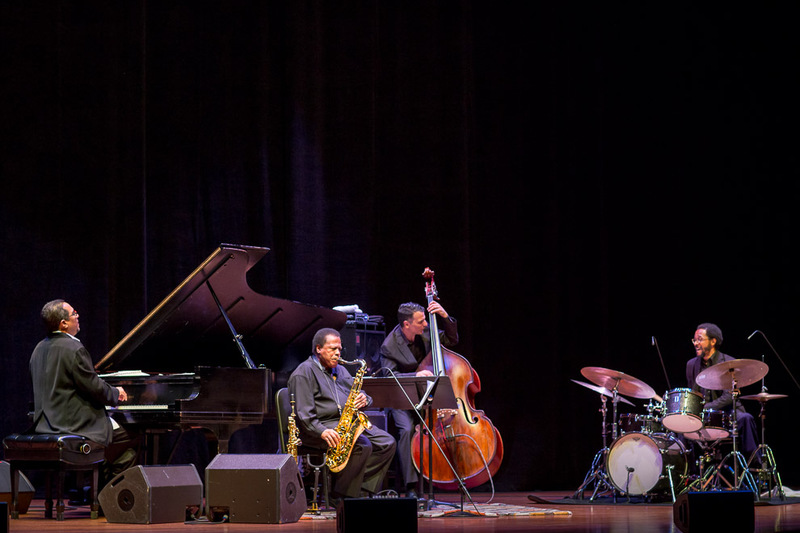 In April, Lloyd returned to Blue Note Records after nearly 30 years for an outstanding live album entitled Wild Man Dance, which also features the pianist in Lloyd’s current Quartet, Gerald Clayton. 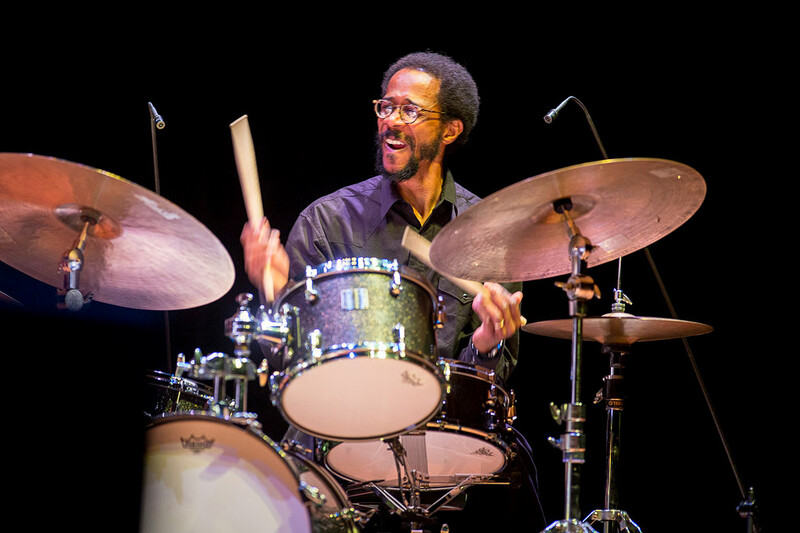 Many of Lloyd’s recent albums and finest live work have been with the same piano/bass/drums quartet format that originally brought him global fame, and his Earshot performance will include, along with Clayton, longtime associate Reuben Rogers on bass and the superb Kendrick Scott on drums. Lloyd has always shown a fearless embrace of the unknown, and he manages to be simultaneously challenging yet warmly communicative and welcoming, deploying a sagely un-ironic affinity for great songs and melodies from any style of music. 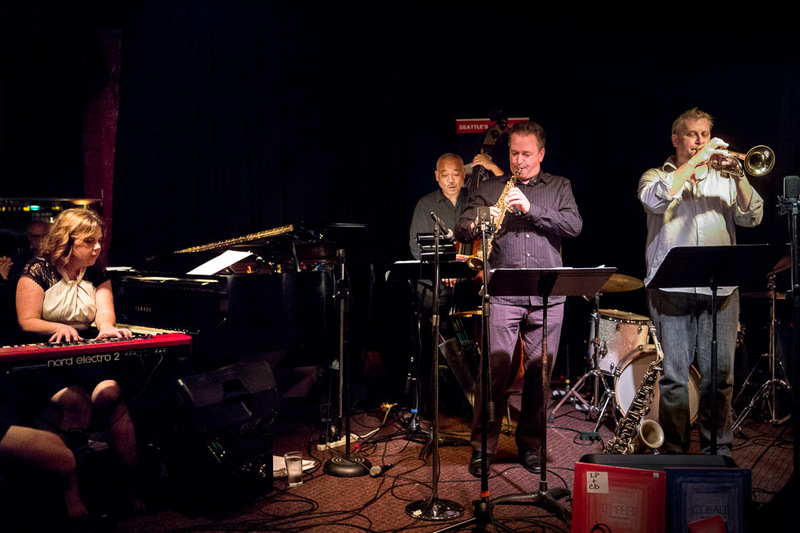 Last night at Tula’s, the 2015 Earshot Jazz Festival presented Saxophonist Mark Taylor who launched a new ensemble with the ebullient pianist and Cornish alumna and adjunct instructor Dawn Clement. 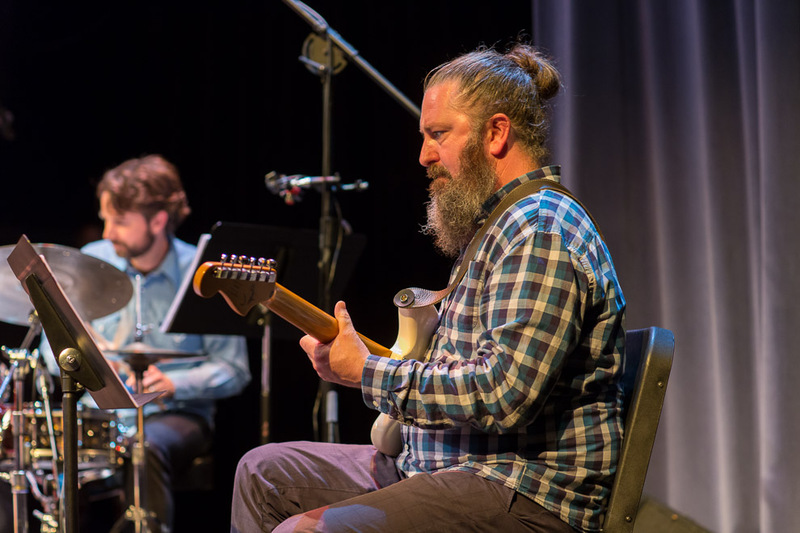 The two award-winning Pacific Northwest artists brought listeners a lineup of new work they are composing together. 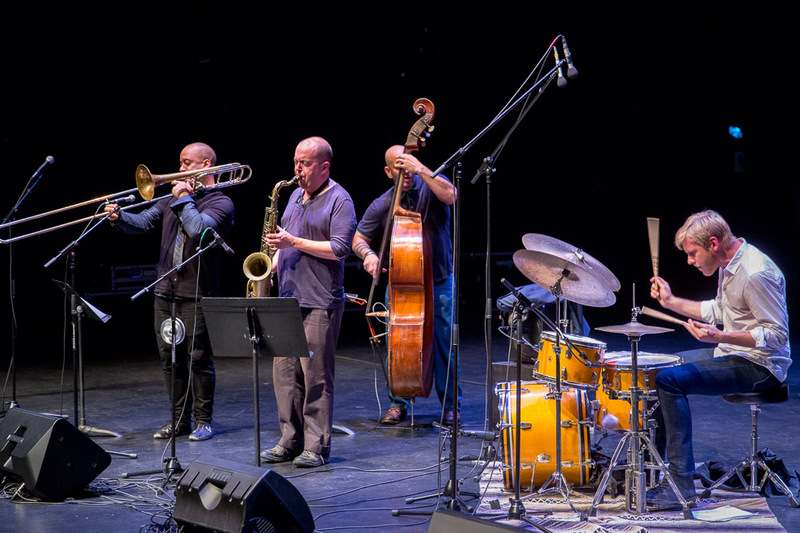 Pieces from previous albums (Taylor’s Spectre and Clement’s Tempest/Cobalt) were also reworked including noted NYC trumpeter Russ Johnson and top-shelf Seattleites Phil Sparks (bass) and Byron Vannoy (drums). 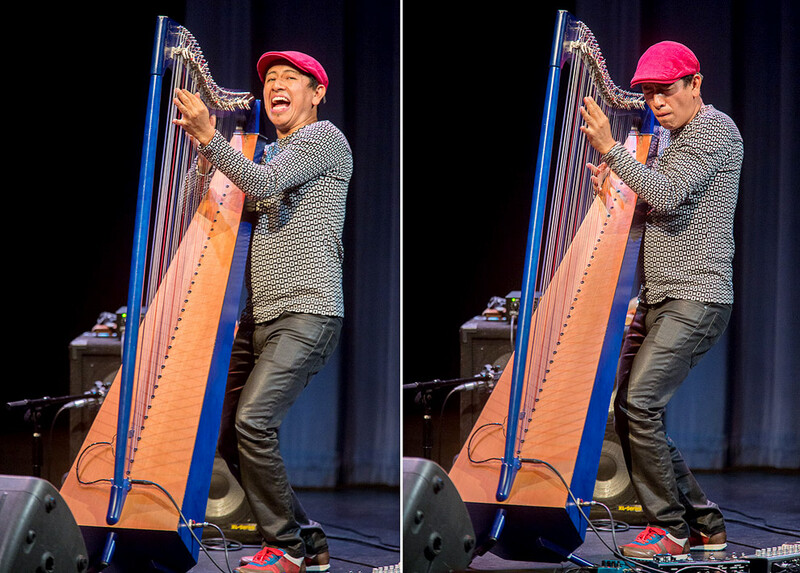 2015 Earshot Jazz Festival presented at Cornish College, in a rare solo performance, the “hippest harpist” (Wall Street Journal), from Colombia, demonstrates the virtuosic command that explains his growing acclaim. 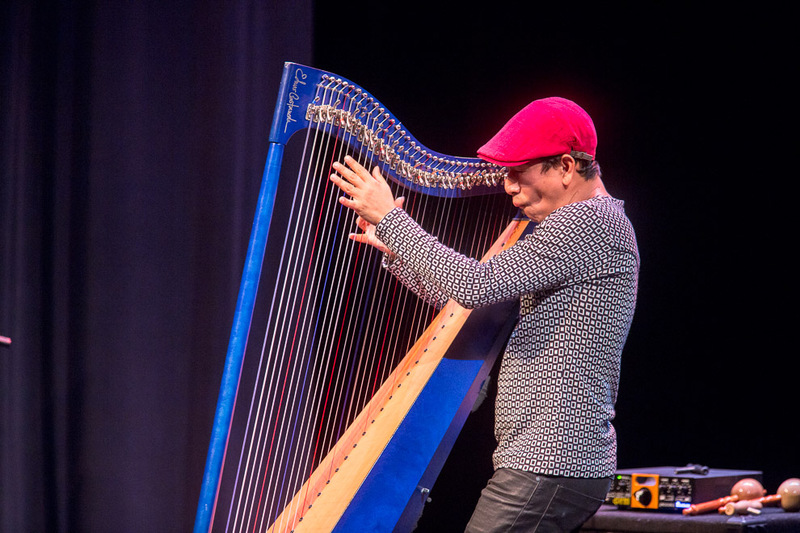 He produces symphonic, rapid-fire, melodic Latin American rhythms. 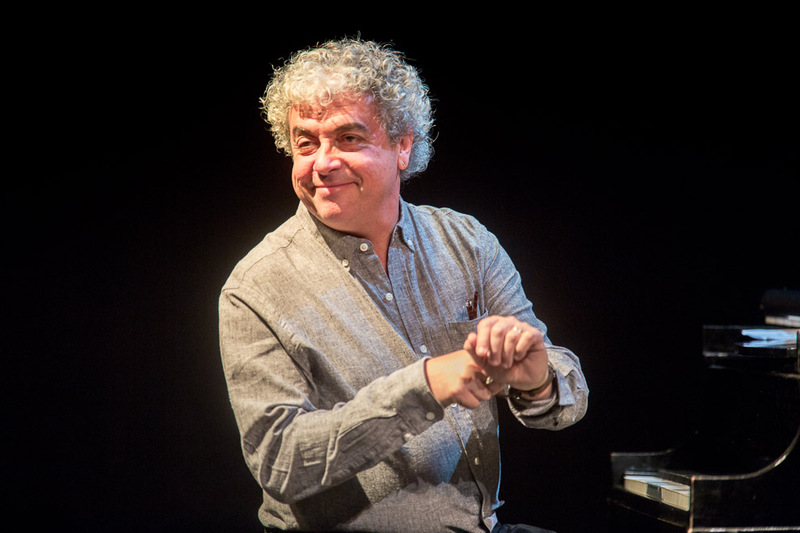 Opening, also in distilled solo performance, is Seattle’s brilliant Brazilian pianist Jovino Santos Neto. After his set Castañeda was joined on stage by Jovino Santos Neto for a duet that was great. 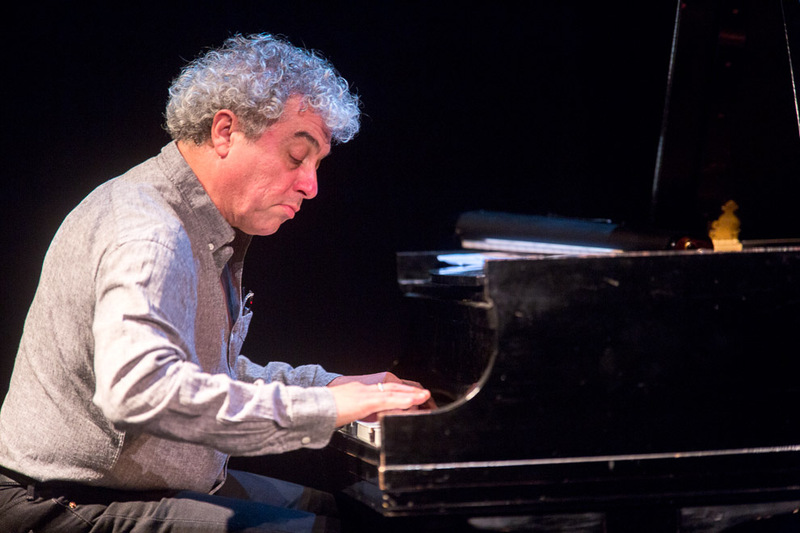 An astounding instrumentalist with a unique approach to South American composition, Edmar Castañeda is gaining respect and acclaim in the international jazz community. 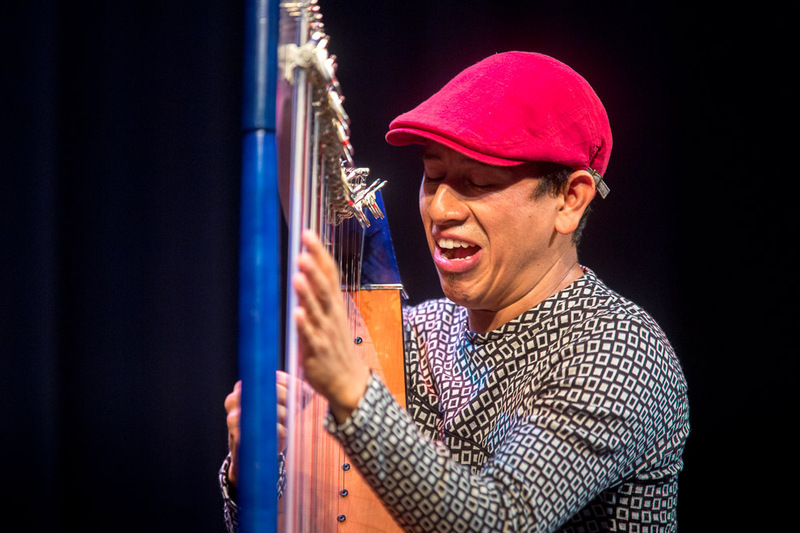 Born in Bogota, Columbia, Castañeda followed his father’s pursuit of mastery on entrancing South American harp. 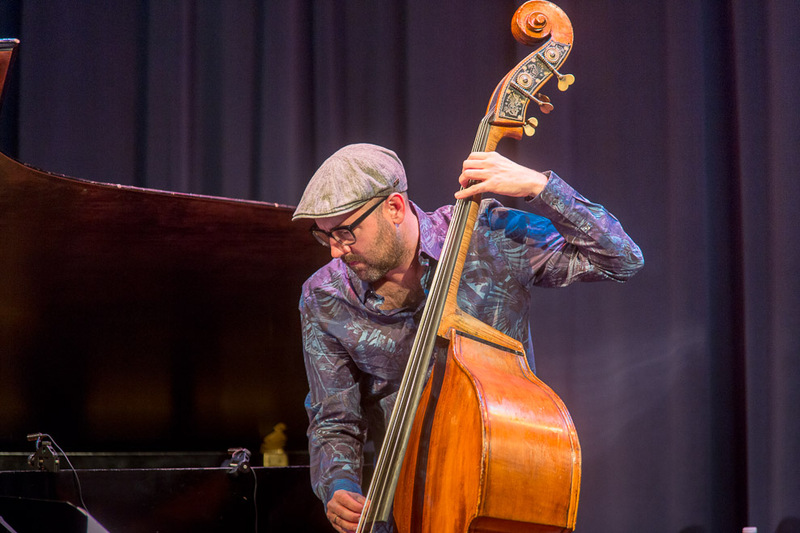 Though Castañeda tours frequently with his trio, and as a member of the Andrea Tierra Quartet, we are fortunate tonight to enjoy the full force of his animated and captivating solo performance. The Brazilian transplant and resident genius, Jovino Santos Neto, opens the evening with a rare solo piano (and melodica) performance. 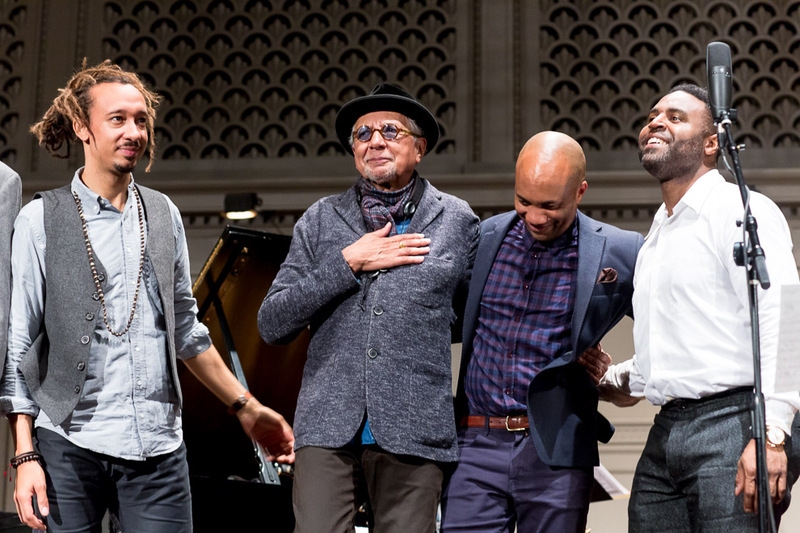 A native of Rio de Janeiro, Santos Neto moved to Seattle, and a fruitful association with Cornish College of the Arts, after a performance stop here with his musical mentor, the great Hermeto Pascal. 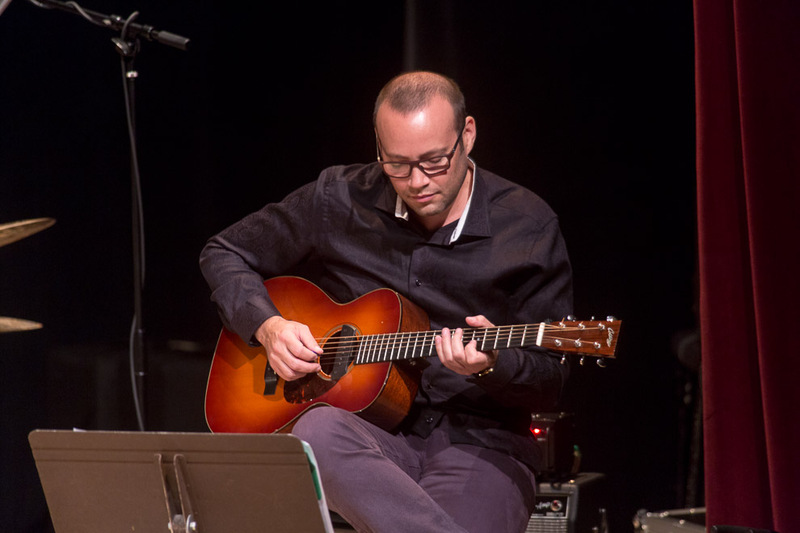 Santos Neto’s mastery of many subgenres of South American music, his gifts as an educator, and his palpable joy in performance have made him a valuable part of Seattle’s music scene. 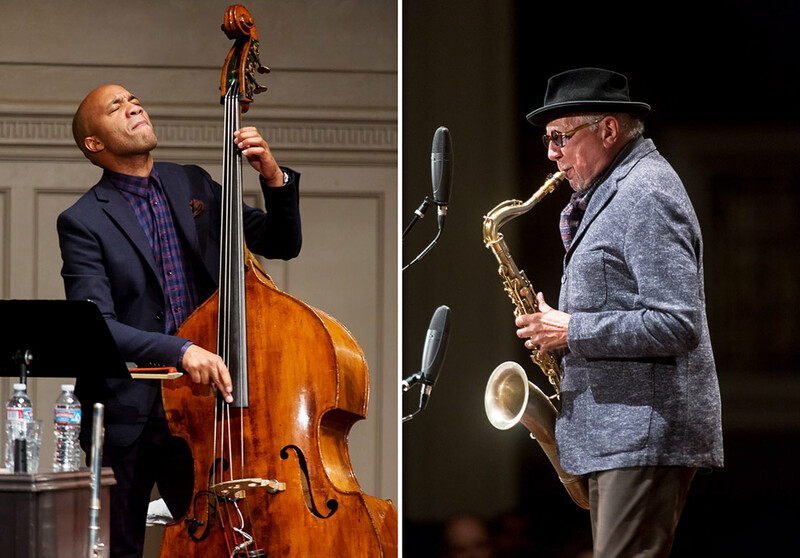 This will be a night of compelling performance, incredible virtuosity, and absolute fun! 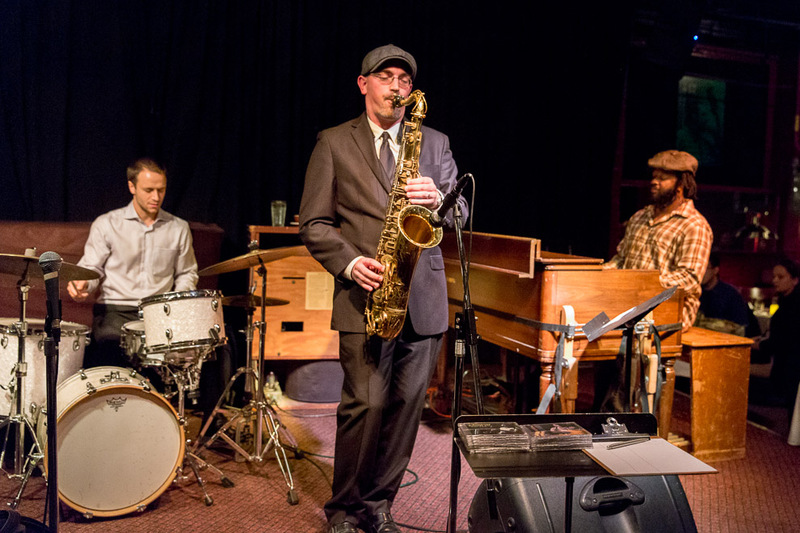 Kareem Kandi, the Tacoma-based saxophonist’s funk- and blues-drenched style was showcased to fine effect in this trio with organist favorite Delvon Lamarr and drummer Adam Kessler last night at Tula’s, as the 2015 Earshot Jazz festival goes on. 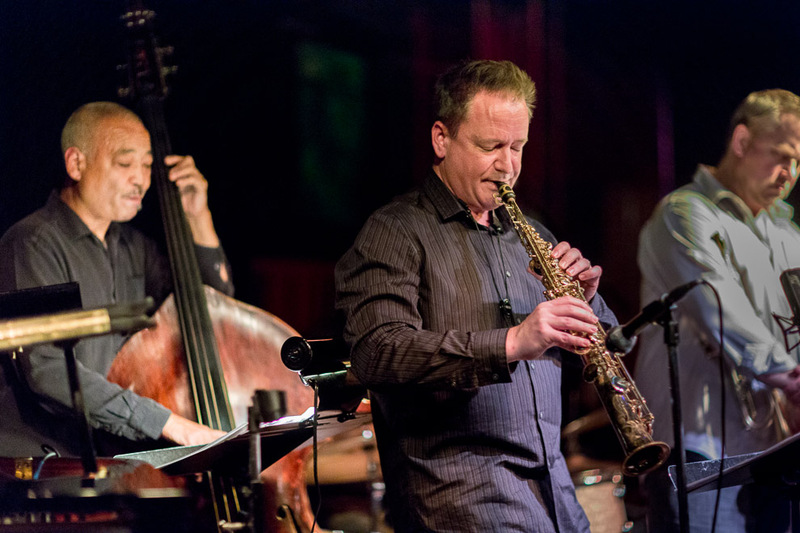 Tenor saxophonist Kareem Kandi teaches 35-40 private lessons per week and gigs three to five nights a week, from Bellingham to Olympia and beyond. 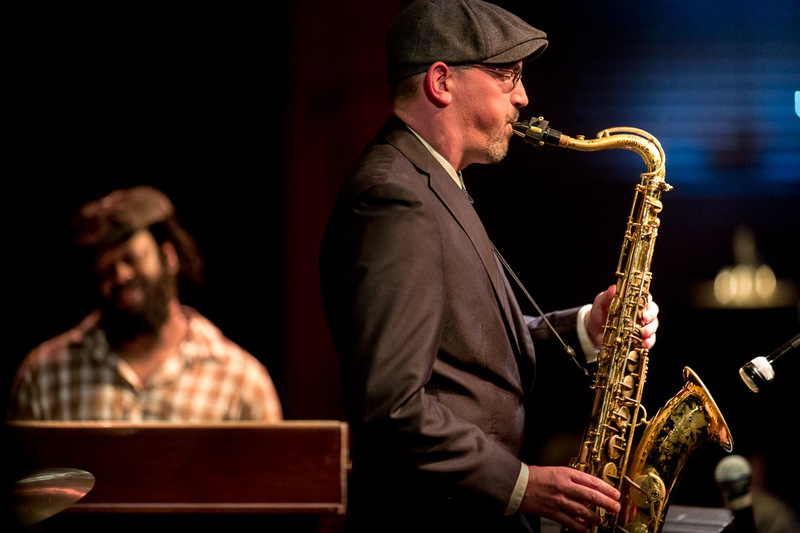 He’s in his 14th year as artist-in-residence at the Tacoma School of the Arts and his ninth at Pierce College, where he teaches saxophone and, until this year, directed its big band ensemble. 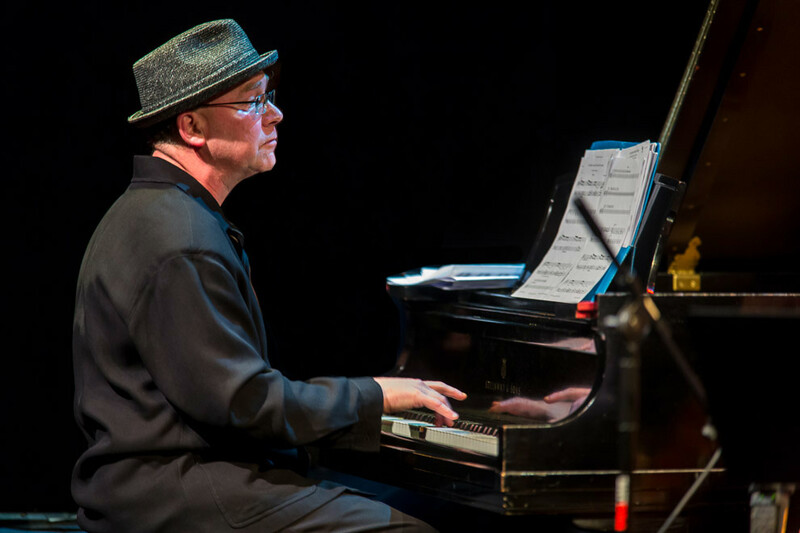 He also plays and tours with the folk super-group The Paperboys, from Vancouver, BC. 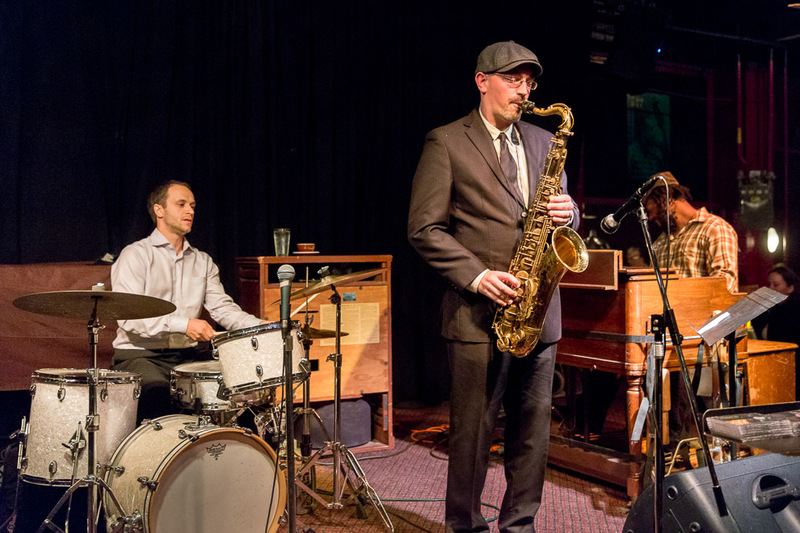 In recent months, Kandi has expanded his bandstand leadership and teaching into a south Sound venture with Boxley’s proprietor Danny Kolke. 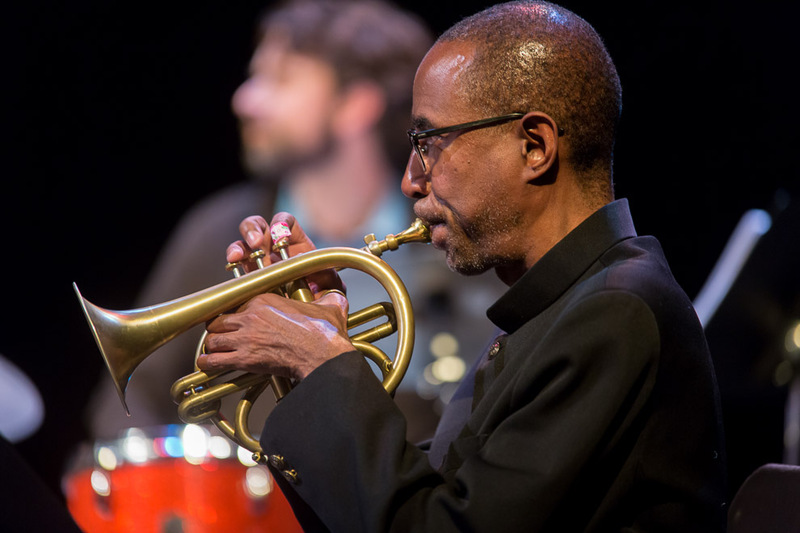 Together, the two have launched the non-profit Tacoma Jazz Association. 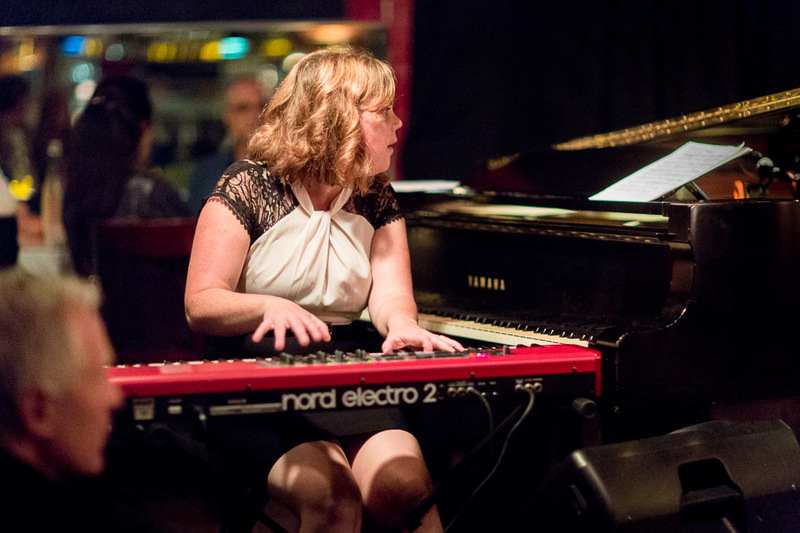 Kandi is a class act and a great, gigging bandleader who charms on the microphone and astounds audiences with long, muscly tenor runs, riffs, and hits: an excellent trio instrumentalist. 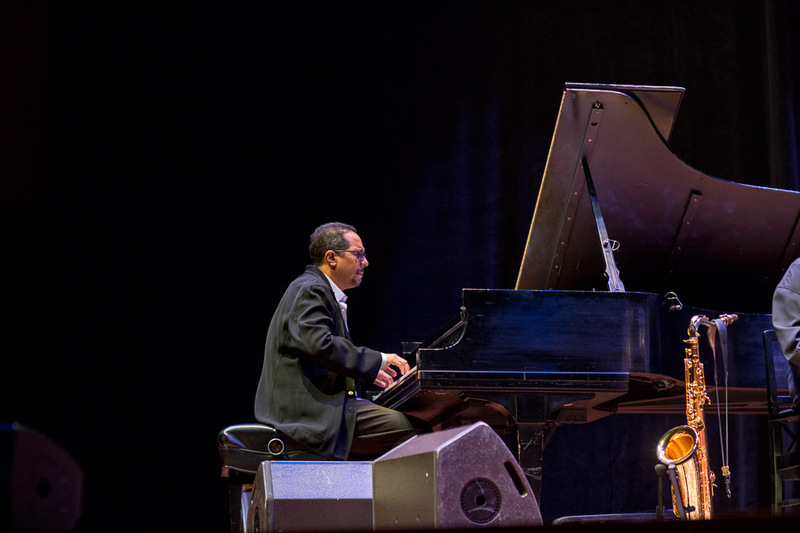 Organist Lamarr learned the instrument by watching bandleader Joe Doria, while subbing as a drummer on the gig. 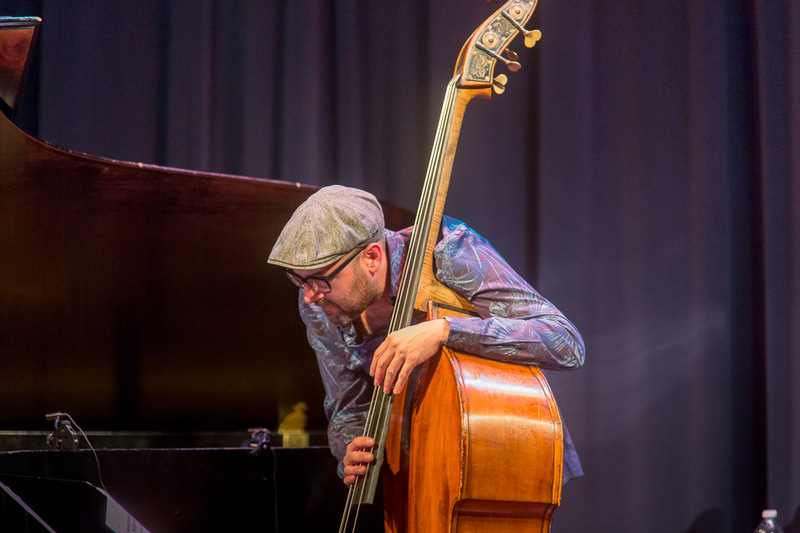 Today, the fluidity of his feet on the foot pedals, his left hand handling the walking bass lines, and his right hand oscillating between comping and soloing – he’s like a well-rehearsed chamber ensemble unto himself. Lamarr was born in 1978 and grew up in a house where his mother listened to gospel and blues while he and his older brother spun hip-hop and Van Halen records. 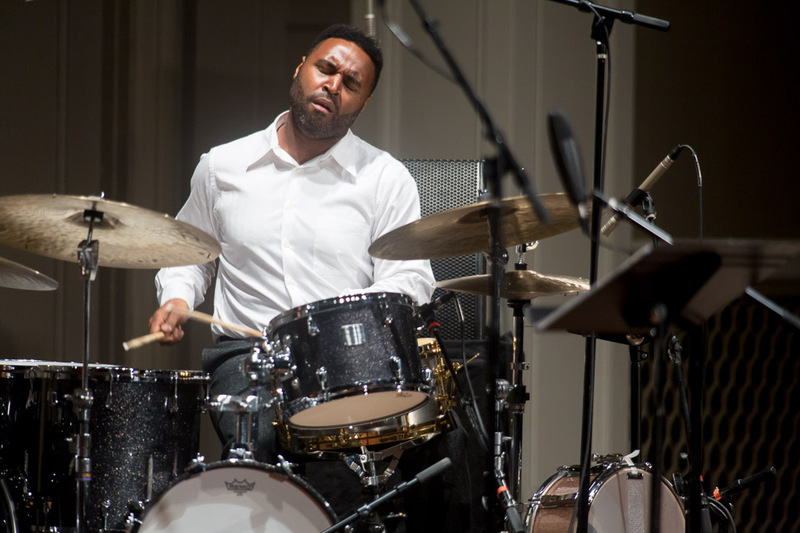 Today, he works in his own funky groove trio, Rippin Chicken, and works regularly with saxophonist Kandi. 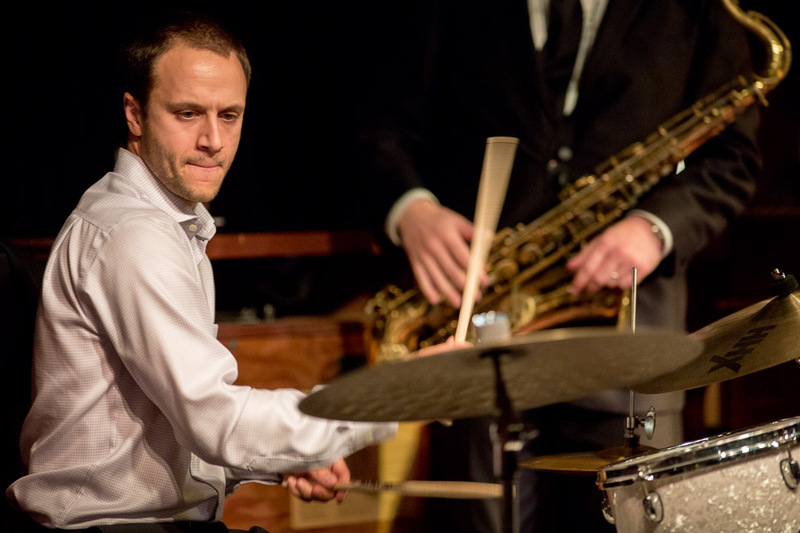 Drummer Kessler is a leader in his own right, from the drum throne at club Barca’s weekly Thursday jazz hang. 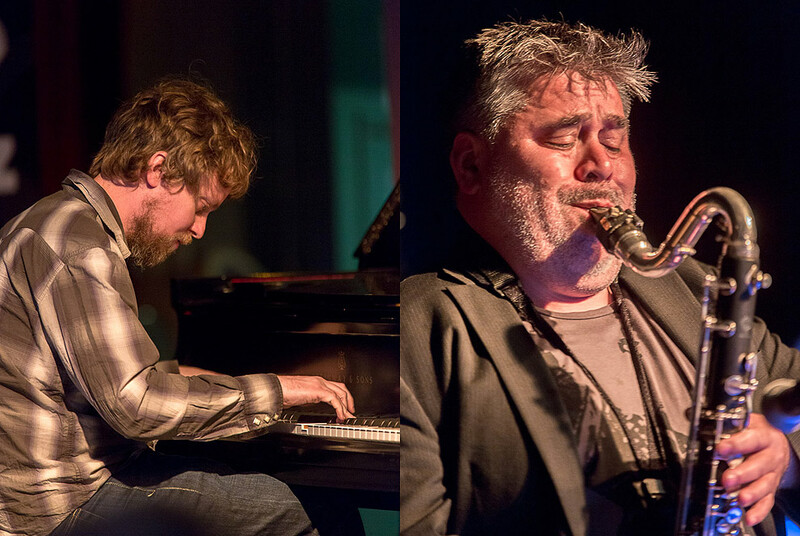 Tight, clean chops and a mastery of the grammar of the jazz trio allow Kessler to sit deep in the pocket. 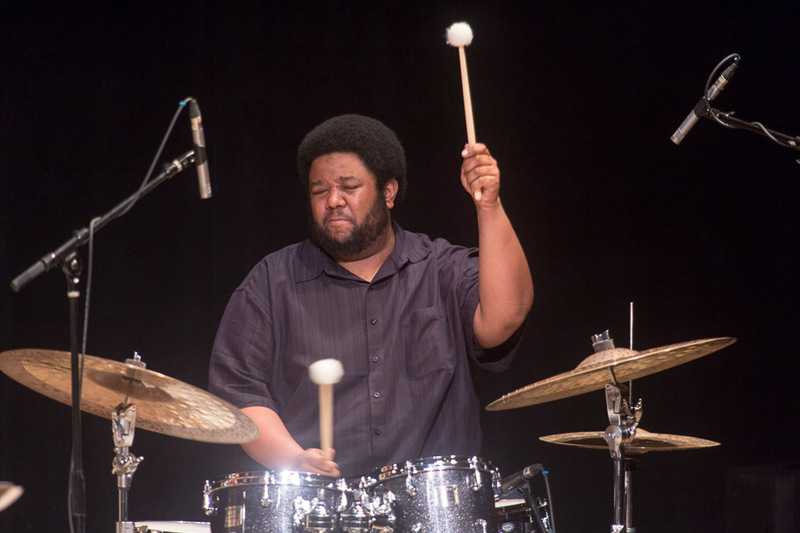 The percussionist and educator was born in Seattle, 1982, and learned about swing in the Roosevelt High School Jazz Band. 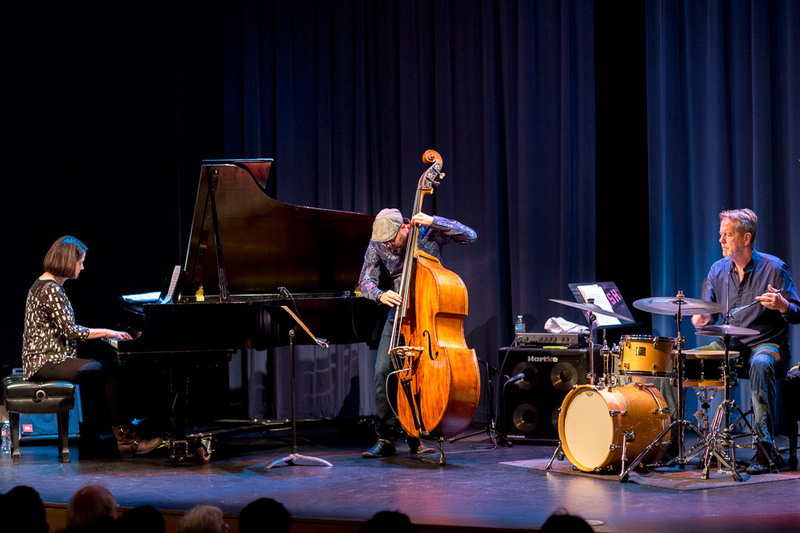 He received a BA in Music from Cornish College of the Arts, where he studied jazz, Brazilian, electronic, Middle Eastern, and gamelan music, as well as musicianship and composition training with multi-instrumentalist Denney Goodhew. 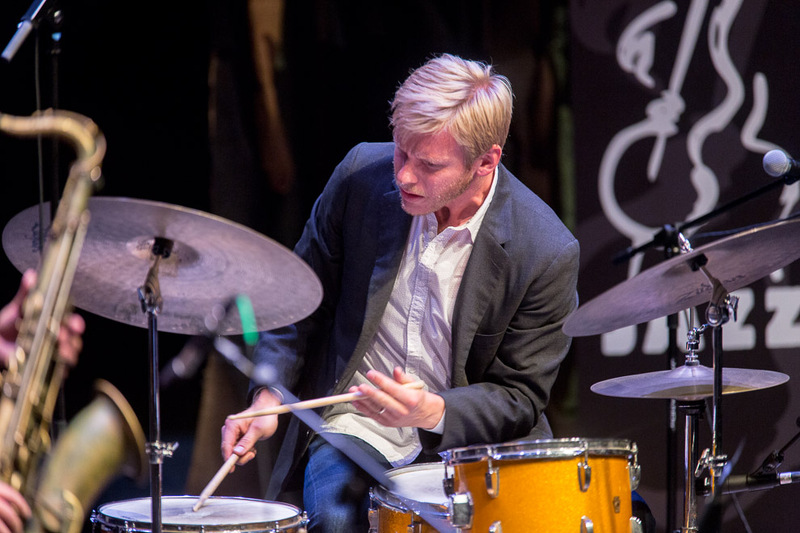 Last night, Oct 15, the 2015 Earshot Jazz Festival presented UW artist-in-residence Ted Poor, on drums, was joined by New-York based musicians Bill McHenry, tenor saxophone; Josh Roseman, trombone; and the great Eric Revis on bass in a concert devoted to Our Man in Jazz, the 1962 album by Sonny Rollins. 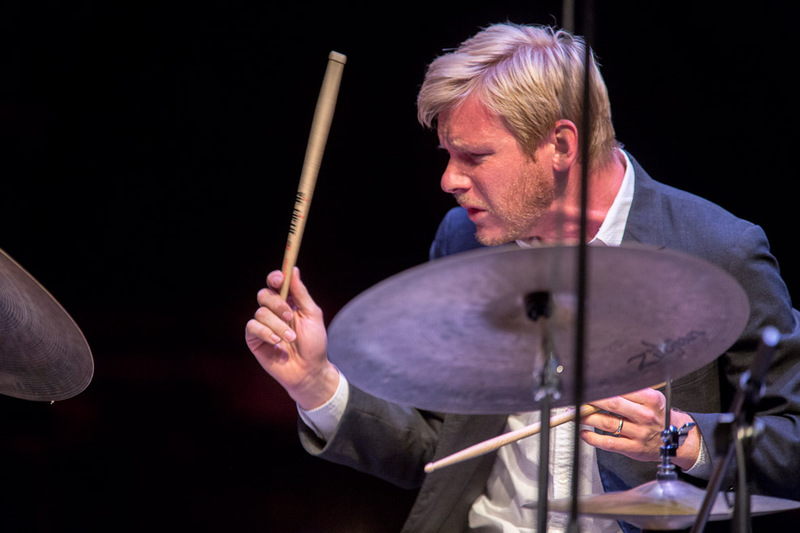 Jazz Review writes, “Ted has an uncanny ability to shape the music and a refreshingly unique, organic approach to playing the drums.” This unique approach has caught the ears of many of jazz’s most established musicians. 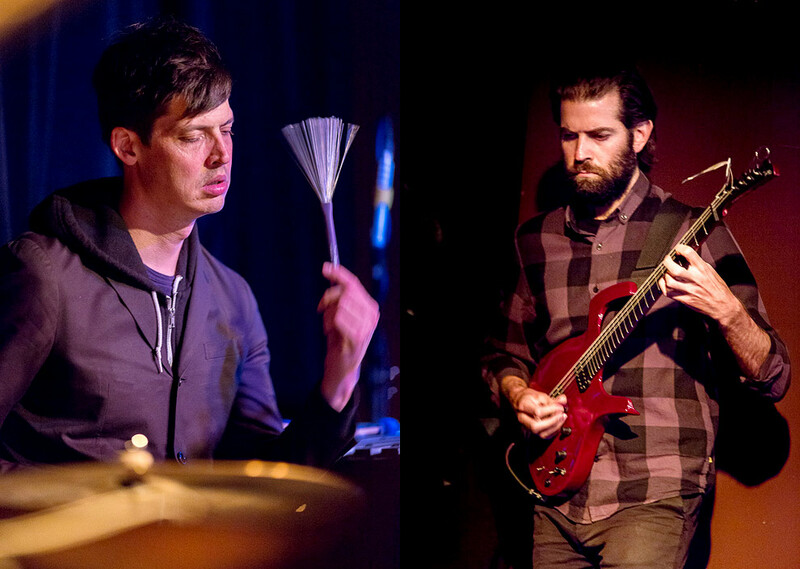 Poor graduated from the Eastman School of Music in 2003 and subsequently became a significant force in New York’s improvised music scene. 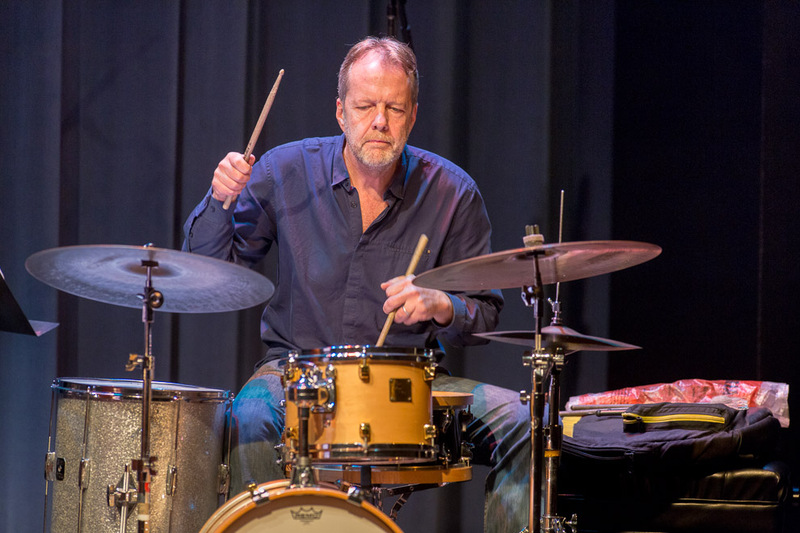 Described by Modern Drummer as an “adventurous, truly dynamic, and forward-thinking” drummer, he is in high demand as a player and has performed and recorded with Kurt Rosenwinkel, Bill Frisell, Mark Turner, Chris Potter, Kenny Werner, Maria Schneider, Aaron Parks, and Ralph Alessi. 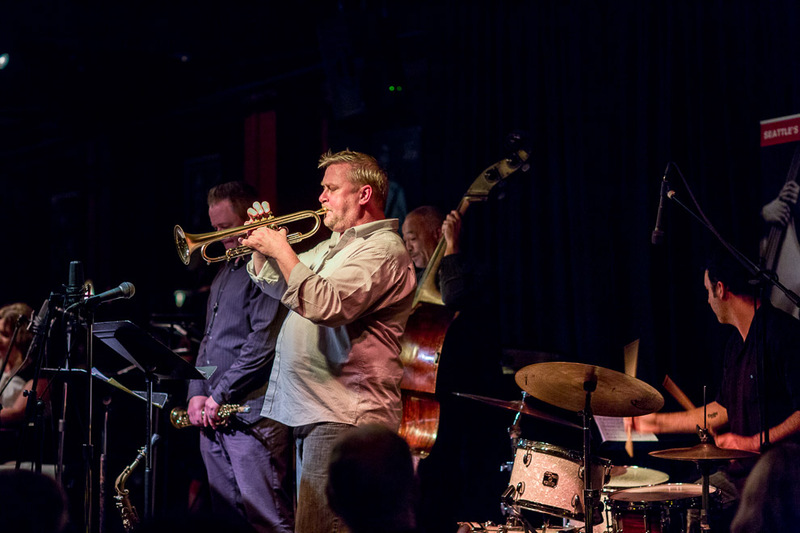 Roseman is well-known in the New York jazz scene as a participant in the Knitting Factory heyday of the early ‘90s. 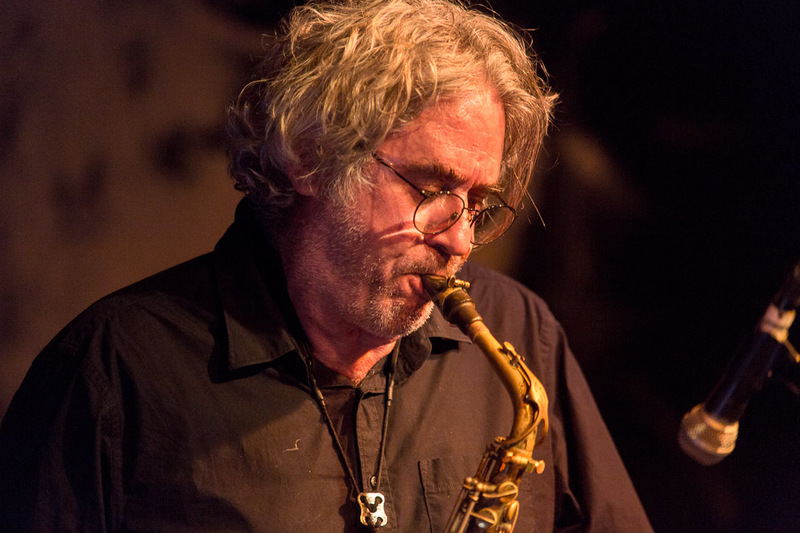 Roseman was acclimated quickly as a co-founder of the acid-jazz dance band the Groove Collective and the less appreciated Giant Step. 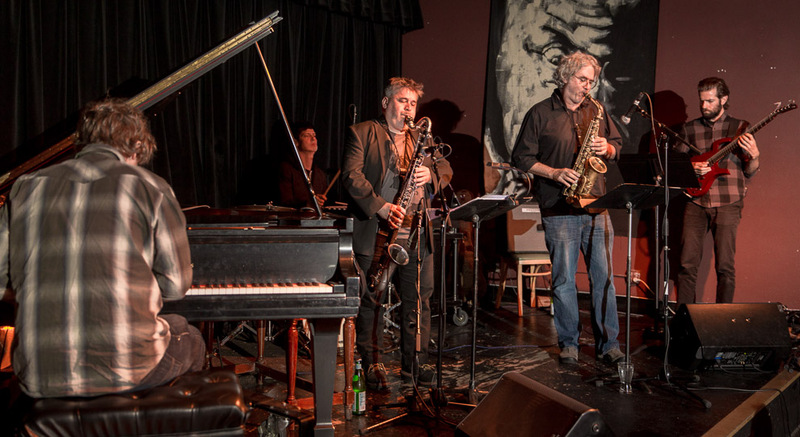 A born experimentalist, Roseman also plays tuba, euphonium, bass, drums, piano, and his Mac. 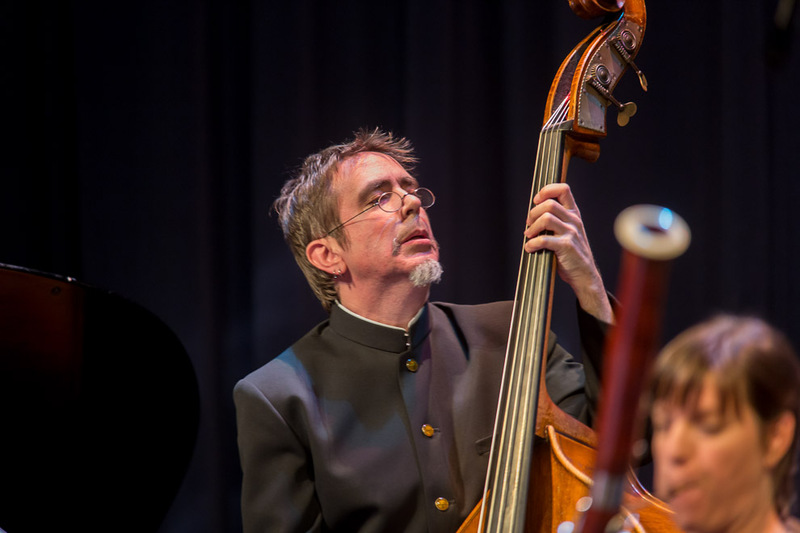 Revis, Grammy Award-winning bassist and distinguished bandleader of experimental group Tarbaby, is an exciting new addition to the group. 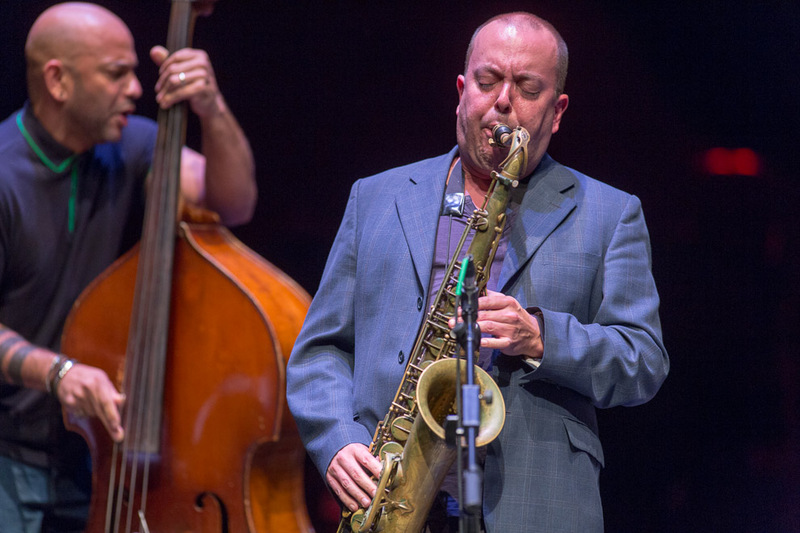 A veteran to large jazz stages, he has been a solid member of Branford Marsalis’ ensemble since 1997. 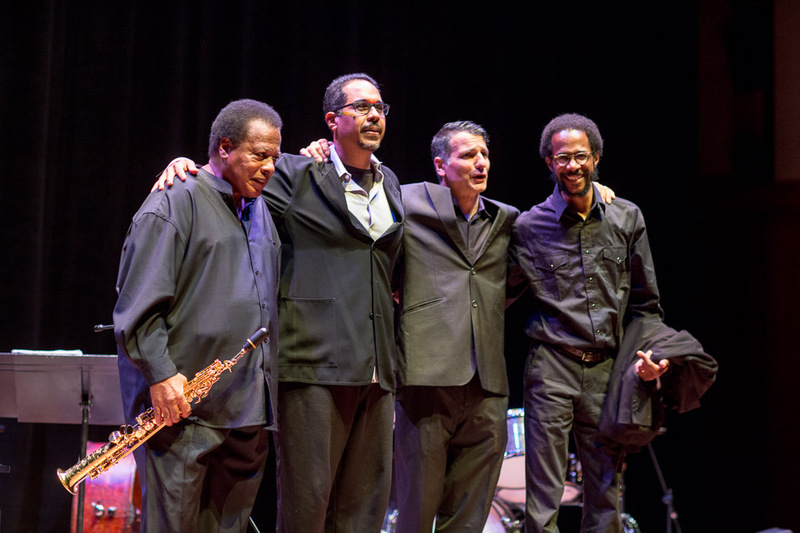 Danilo Pérez, Wayne Shorter, John Patitucci and Brian Blade. 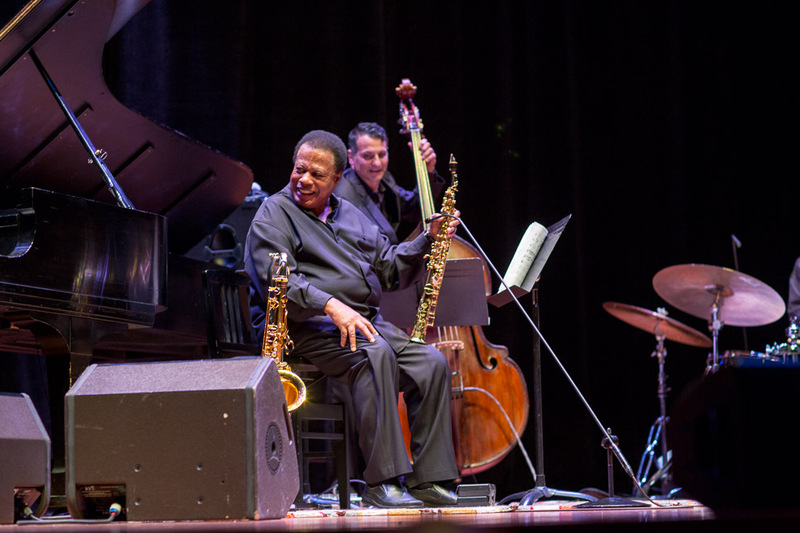 Sunday night the 2015 Earshot Jazz Festival presented one of the best performances of the year at Benaroya Hall, the Wayne Shorter Quartet. 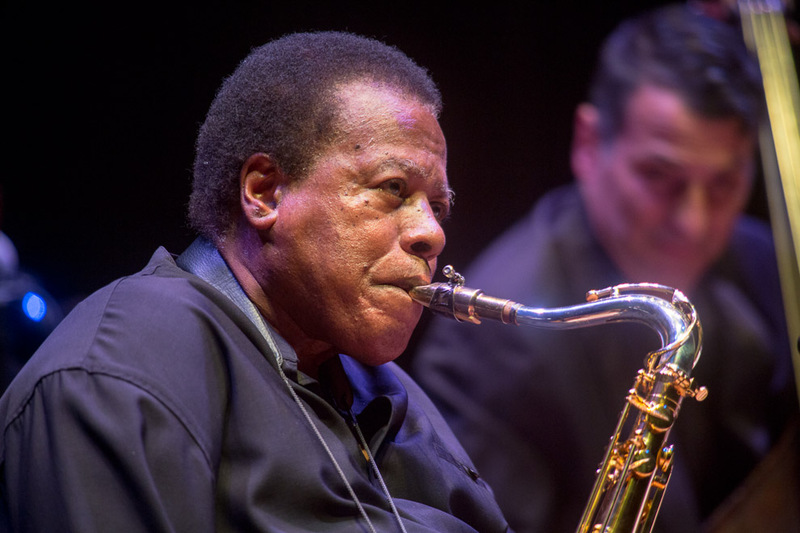 One of the most influential saxophonists and composers in the pantheon of modern music, let alone jazz, Wayne Shorter has an outstanding record of professional achievement in his historic career as a musician. Regarded as a pioneer since his emergence in the 1950s, his trajectory has restlessly embodied continual exploration and unencumbered momentum. A generation of musicians and fans see and hear him as a humble master who created a timeless vocabulary – as vital as it is unbound. 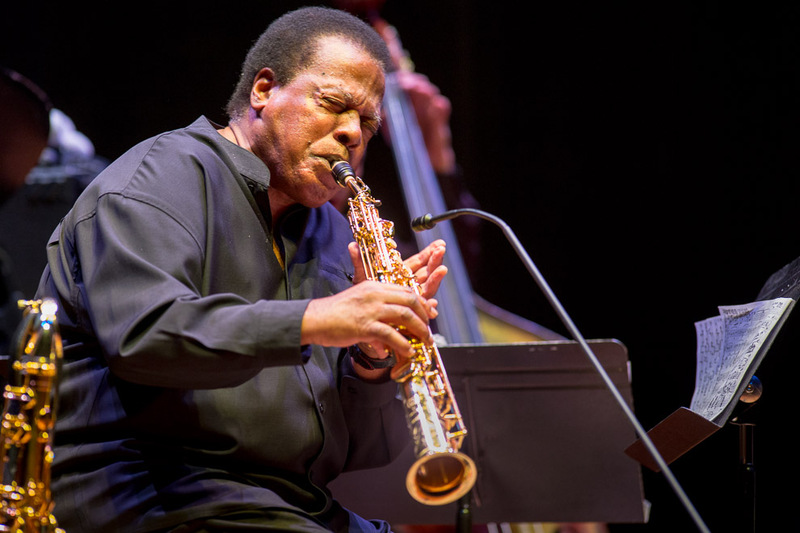 Shorter won in three categories of the 2014 Jazz Journalists Association Jazz Awards, taking honors for Musician of the Year; Record of the Year for his quartet’s searing Blue Note release, Without A Net; and the Wayne Shorter Quartet was named top Midsize Ensemble of the Year. 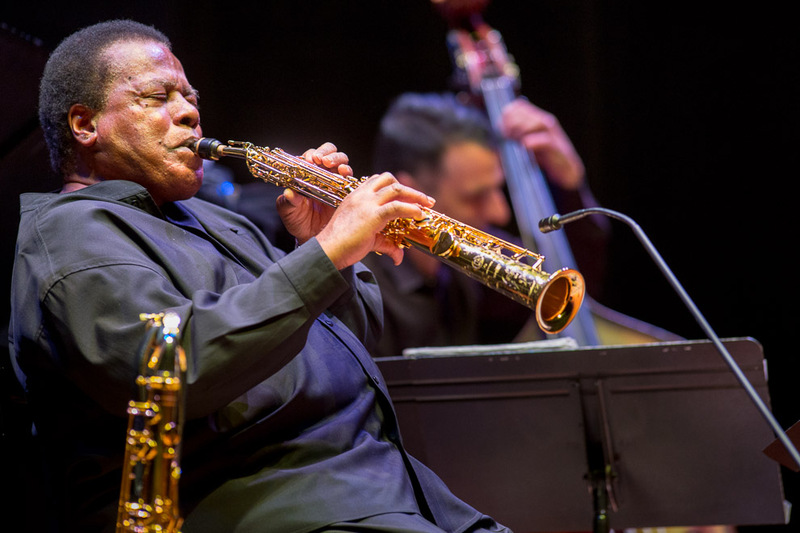 If the prolific composer had never written a single tune, his signature sound and choice of notes, sense of economy and unparalleled expression on both tenor and soprano saxes would have earmarked him for greatness. Combine the writing prowess with the fragmented, probing solos and the enigmatic Buddhist philosopher presence and you have the makings of a jazz immortal. 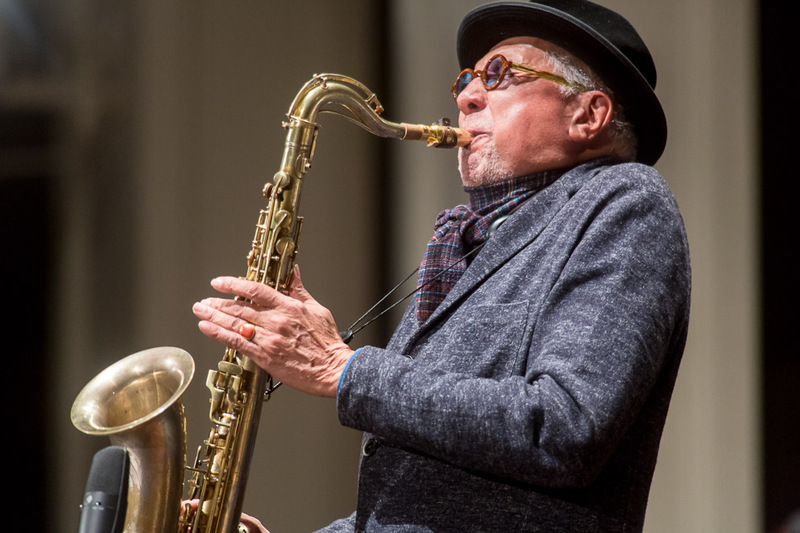 Last night at Cornish College 2015 Earshot Jazz Festival presented Wayne Horvitz’s Some Places are Forever Afternoon (11 Places for Richard Hugo), the first of three events marking Horvitz’s 60th birthday and his considerable contributions to Seattle jazz culture. I loved this set of music. 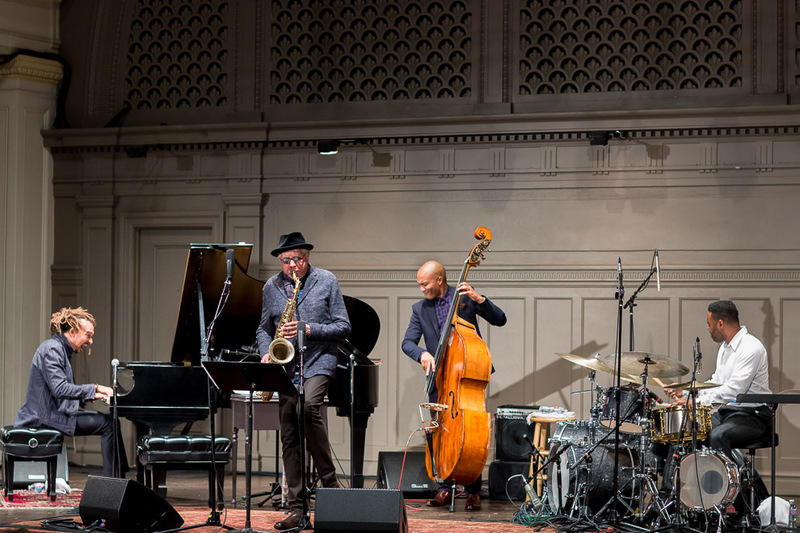 In the summer of 2014, Horvitz traveled throughout the Pacific Northwest to places where the poet Richard Hugo, who was born in White Center, had created his verse. Hugo lived throughout the Northwest before settling in Missoula, where he taught poetry at the University of Montana until his death in 1982. He cherished small towns and odd places, from West Marginal Way to La Push to the Union Bar Grill in rural Montana. He sat in cafés and bars for hours before going home to write. And he was a great lover of jazz. 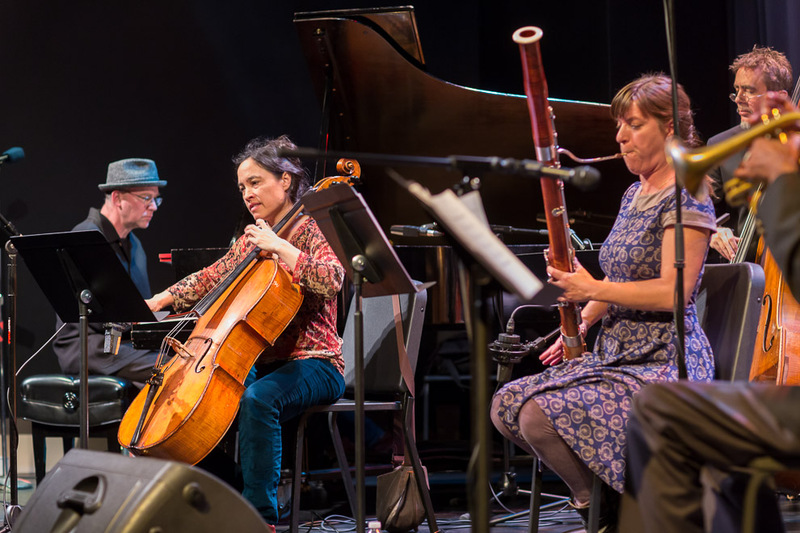 Horvitz has taken 11 of Hugo’s poems inspired by place as inspiration for 11 musical pieces. Each poem is read following the performance of the corresponding composition. 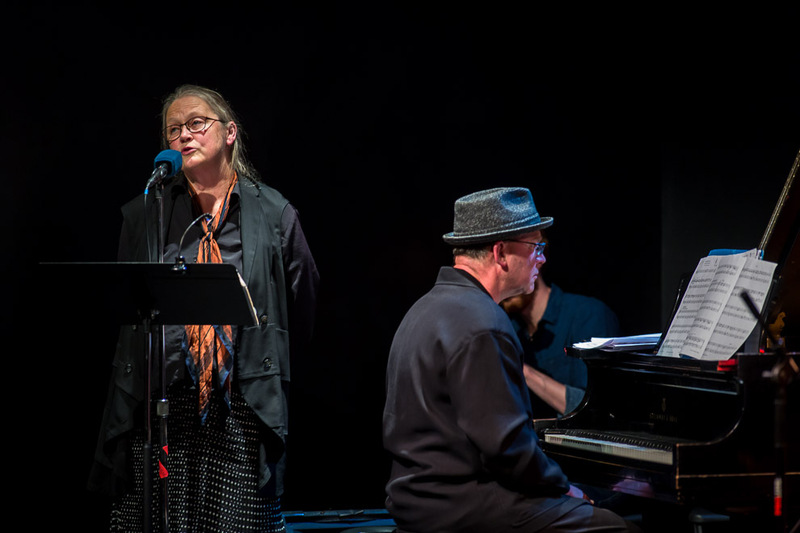 Horvitz is on piano with members of his Gravitas Quartet and Sweeter Than The Day groups: Ron Miles(trumpet), Peggy Lee (cello), Sara Schoenbeck (bassoon), Timothy Young (guitar), Keith Lowe (bass), Eric Eagle (drums), with Robin Holcomb and Francis McCue reading the poems.